Detroit, MI  On Sunday, December 19th, the Ukrainian Bandurist Chorus and Metropolitan Opera soloist Paul Plishka presented "Bandura Christmas International" at the Macomb Center for the Performing Arts in Clinton Township, Michigan, USA. The attached photo from the concert depicts the dedication to the Orange Revolution the Chorus presented during the performance of the English Hymn "Amazing Grace." 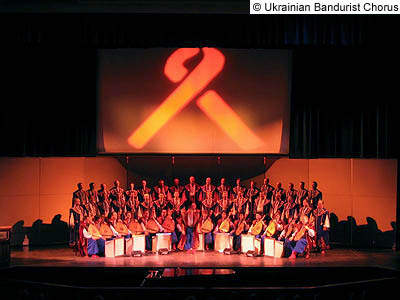 The Chorus passed out orange ribbons to the audience during intermission.